“Oh dear, Eric. Not many cabinet members in U.S. history have been held in contempt of Congress, but he still wants to weigh in,” Palin said. Former Alaska Gov. Sarah Palin hit back at Attorney General Eric Holder on Saturday for criticizing her call to impeach President Obama over the border crisis. “I don’t need lectures from Eric Holder, a guy – get this – so incompetent that he denied voter fraud existed even after someone claimed that they were Eric Holder and they got his ballot and they voted in D.C.,” Palin said at the Western Conservative Summit in Denver. Palin was referring to an April 2012 video by a conservative activist that showed a man entering a Washington, D.C., polling center and requesting Holder’s ballot, offering up the official’s mailing address. The video did not actually show a ballot being cast in Holder’s name. Earlier this month the former Republican vice presidential candidate called for the president’s impeachment for his handling of illegal immigration. “This unsecured border crisis is the last straw that makes the battered wife say ‘no mas,’” Palin wrote on the Breitbart website. WOW, JUDGE JEANINE PIRRO SAYS WHAT MANY AMERICANS FEEL, ENOUGH IS ENOUGH … MUST WATCH VIDEO! Over the weekend in her opening monologue Judge Jeanine Pirro blasted President Barack Obama for the release of the GITMO 5, the five high ranking Taliban terrorists, in exchange for deserter Bowe Bergdahl. But this may have just been the final straw of many scandals and reprehensible acts against the military that question whether Obama is a real Commander in Chief. Mr. President, you did not just release them [GITMO 5] … you unleashed them!!! At least there is some consistency on the LEFT to the Imperial Presidents actions. Former Ohio Congressman and self-avowed Lib Dennis Kucinich warned that President Barack Obama faces impeachment if he takes military action against Syria without congressional approval because as there was no no “imminent or actual threat” to America. Kucinich also takes issue with how Obama phrased his statement earlier today; however, I am not sure how this is an epiphany to anyone that Obama cares little about the US Constitution and following it. Not so, says Kucinich, and the president risks impeachment if he does. “There is no imminent or actual threat to the United States of America. If there was, then people expect the president to defend us. But in this case the president is going on his own,” Kucinich explains. “It’s not ‘I the President,’ it’s ‘We the People of the United States,’ Kucinich says after quoting the president saying earlier on Friday: “I meant what I said, I have not made a final decision.” Kucinich points to Article 1, Section 8 of the Constitution, which says only Congress has the power to take America to war. “That’s a fundamental principle and if the president throws that away, disregards that I think there will be consequences for him,” he said. President Barack Obama Sounding an Awful Lot Like Richard Nixon (VIDEO) … ” I First Learned of it from News Reports”. Hmm, President Barack Hussein Obama is sounding an awful lot like Richard Milhous Nixon these days. The video below by Reveal Politics has side by side Obama – Nixon sound bytes and it sounds like they are separated at birth. Even CBS’s Bob Sheiffer of ‘Face the Nation’ stated to White House advisor Dan Pffeiffer, this is exactly the approach that Nixon took during Watergate. Nixon had Watergate, but Barack Obama is juggling three scandals, or is it four, at the same time and doesn’t have an answer for any of them. For those that refuse to compare Obama’s scandals to Watergate, what’s the difference? Both attacked political opposition, both used the IRS to intimidate, harass, and affect political outcomes. Both used the powers of the government against their political enemies, heck and even friends in the MSM. Oh, there was one difference … no one was left behind in Benghazi to die as they begged for help. 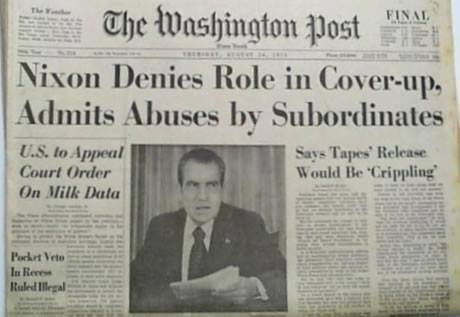 Remember how Democrats reacted when Nixon was caught in one scandal? But of course there is a double standard for Obama. Sorry, one scandal might be explainable. Two, makes one start to raise their eye brow. Three, is a very troubling trend and four, we begin to use the “I” word. The LEFT is losing their collective minds that their Obamamessiah, the president of ‘Hope and Change’ is nothing more than Richard Nixon with a “D”.